“We need our students to have the opportunity to take full advantage of the efforts made by the Educational Revolution of President Danilo Medina, with an unprecedented investment in the different edges that make up a good education, with better trained teachers and modern infrastructure, and that is only possible in a total environment of peace, tranquility and security, “said Peña Mirabal to instruct the plan to the School Police, said Antonio Peña Mirabal. The official called the families represented in the associations of parents, mothers and friends of the school (APMAE), as well as the other entities that work on education, to join this great purpose of improving the environment of schools. After receiving instructions, the director of the School Police, Colonel Giovanni de Jesus Gil Suarez, immediately launched the peace plan, with simultaneous meetings held in different public schools in the provinces of Duarte and Valverde, belonging to the Northeast regions and Northwest of the country, where expert security officers and a team of experienced psychologists exchanged impressions with students, teachers and administrative staff about the realities that are experienced in the schools. Likewise, actions were coordinated and agreed upon with the directors, the teaching staff and with the different leaderships of the educational communities, in order to achieve, in the shortest possible time, a peaceful coexistence among all the actors involved in teaching. 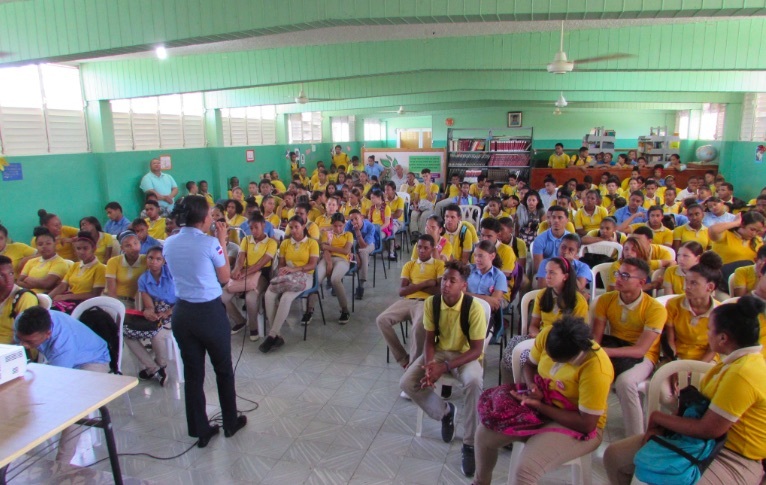 The first schools played by the program were the Educational Center Juan de Jesus Reyes Aranda, in the municipality of Mao, Valverde, and the Liceo Américo Lugo, located in San Francisco de Macorís, where the security experts of the School Police, and experienced Behavioral professionals, knew the concerns expressed by students, teachers and other actors, as well as the problems that are most worrisome. Among the issues addressed are the use of social networks as a valuable tool for the individual and collective development of people, as well as talks on the risks of physical and emotional abuse that are caused through the harmful practice of bullying, in addition to group dynamics oriented towards the need to cultivate values, good customs and respect for legal norms. Among those participating in the activity are the professors and directors Celidania Rosario, Midalba Ureña, Virgilio Alberto and Apolinar Alejo, of the school district 07-05, as well as the colonels Rafael Encarnación Santos, Juan Francisco Gatón and Diego Pesqueira; the psychologists Miosotis Feliz and Luisa Terrero, and also Colonel Humberto Flores, representing General Boris Goyco Campagna, director of the Northwest Regional located in the city of Mao.